I have been supporting PalDev, the first (and I think only) .NET User Group in Palestine for many years. It started as a vision of Jihad Hammad a friend of mine, about 6 years ago. Goksin Bakir, Malek Kemmu, and some others in the community have also rallied behind PalDev. This is a user group that had its first meeting in a refugee camp, then moved to Al-Quds Open University. Now they have almost 200 members and just helped launch Windows 7 and organize Microsoft’s first ever TechDays in Palestine. 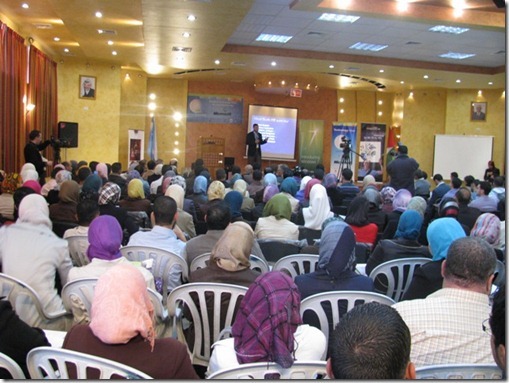 The event was a great success, held over three days in three cities in Palestine. Attendance at the first day in Hebron, was about 250. Goksin was suppose to speak at the event but did not have the proper visas and was turned away at the border, so he went to Jordan and did a LiveMeeting! This is a region with a tremendous amount of political instability, to say the least. I encourage all members of the community to help out, contact Jihad and do a session via LiveMeeting, or travel to Palestine and deliver a talk. You won’t regret it and you will do more to bring peace to the Middle East then all of those politicians out there. You can read Jihad’s post here. The Palestine Information Center (http://www.pitcenter.org) is a passion of mine. A very courageous friend of mine in the West Bank, Jihad Hammad, has created the PIT and put in most of the hard work so far. I am the Development Director and also sit on the Advisory Board (along with a few others you may recognize from this blog like Richard, Clemens and Goksin). I have donated a lot of my time and money to this effort in a bid to get it off the ground and off the ground it is! The vision is simple. Create an IT Community/Training Center in a place that desperately needs one. Hold classes to get people certified in MS technologies (as well as Java and Linux). Provide a library and lifetime learning resource. A bridge to industry. Then mid to long term, have the center partner with local government, business and university to have the newly certified people work on projects under the direction of project managers at the center. The center can be a software and networking resource for the local industry and government. We would like to produce professional “white collar” workers in an economy that needs them, but also partner with the local industry to more easily place these newly trained people on projects. The Al-Quds Open University has offered PIT the opportunity to use their lab free of charge for this beginning phase. The PIT curriculum would differ from the typical University Computer Science department courses as it would seek industry leaders to teach the courses with the goal of the courses to be industry certification and lifelong learning. We have four workshops under way. The first one is an Excel class to get started. It is in progress this week! The Execl class in progress is for the Bethlehem Arab Society for Rehabilitation (http://www.basr.org/) Ultimately we plan to target the MSCD and MSCE curriculum. For now we are just getting interest in the center amongst the population and the university students.